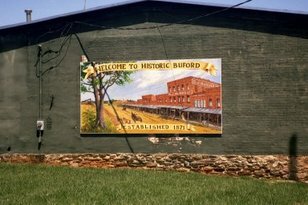 The City of Buford has come a long way since its beginnings in 1872 as a depot on the railway line between Atlanta and Charlotte, North Carolina. Named after Algernon Sidney Buford, Buford was originally called "The Leather City" because it was known as a historic tannery town. Buford never had the sleepy little village aura which characterized many small towns in Gwinett County. The town was blessed with far-sighted citizens, interested in business and education. At one point, Buford was called the “city of many factories” as well as the “New York of Gwinnett” because of its tanneries, schools, the first bank in the county, and even some farming operations. Buford today is just as progressive, and culturally rich. The city is home to the Buford Artists Colony, where over 30 artists make and sell art, pottery, jewelry and furniture in the shops of Main Street Buford. Buford residents enjoy boating, camping and other outdoor activities at Lake Lanier Islands and local parks. Much of the city’s historic past has been preserved as well. Buford real estate is now one of the fastest growing and prestigious markets in Georgia. Because of the city’s progressive nature and strong sense of history, many buyers are interested in settling down here. Whether you wish to buy single-family homes, townhouses, or any other residential units available in Buford, you can count on Executive Home Sales and the Terry Hayes team to help you out. Contact us today to begin the process of acquiring your dream home in Buford or anywhere else in the North Atlanta market.